This property has beaches on either side and a local store on the grounds. It is not far from where locals come for surf competitions. Expect excellent service and delicious food. The service is above and beyond. At InterContinental® Bora Bora Le Moana Resort, the day starts with breakfast in your overwater bungalow, delivered on a wooden canoe decorated with exotic flowers. Spend the morning exploring world-class dive sites, jumping straight off your private pontoon into azure waters for a swim, or beachcombing along stunning Matira Beach. Elsewhere on the island, Mount Otemanu provides some vigorous hiking and stunning views, or just potter about the main village for famed Tahitian black pearls. Sheltered by the Bora Main Motu Reef, this luxury beach resort is reached by boat from the Bora Bora Airport and is 8 km from the summit of Mont Otemanu. The thatch-roofed, beachside bungalows offer traditional Polynesian design, shaded decks and elegant bathrooms with soaking tubs and outdoor showers. All also feature separate sleeping areas, and room service is available. 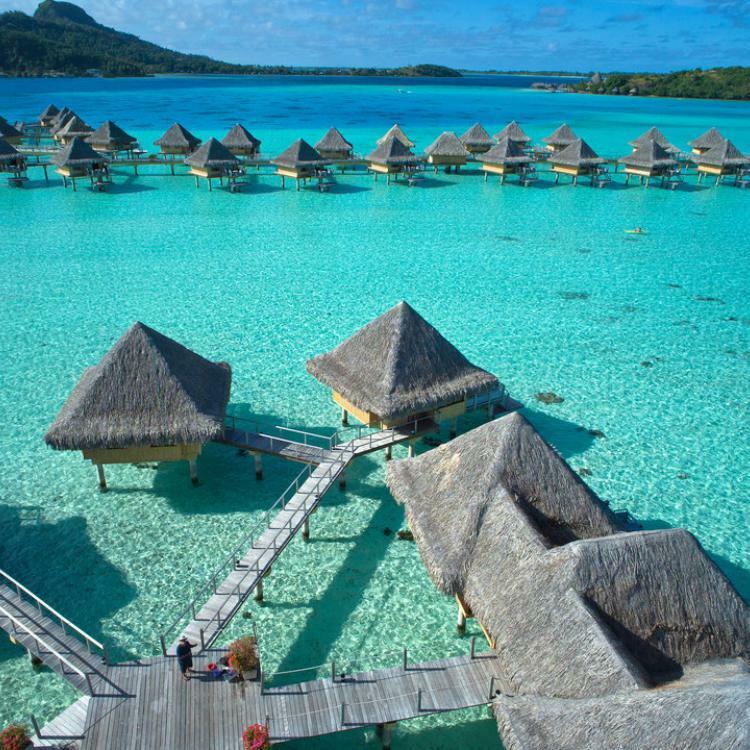 Plush overwater bungalows offer swimming decks, underwater observation windows and direct ocean access. Amenities include 2 tropical, open-air restaurants, a saltwater lagoon and an infinity pool. There’s also a luxe spa, as well as kayaks and snorkeling gear.